Clean, effective, efficient – that’s the DryVac double vacuum treatment system, developed specifically for the millwork manufacturer. If you want a better way to treat door and window components and improve their durability and your productivity, then EverDry’s DryVac system is for you. 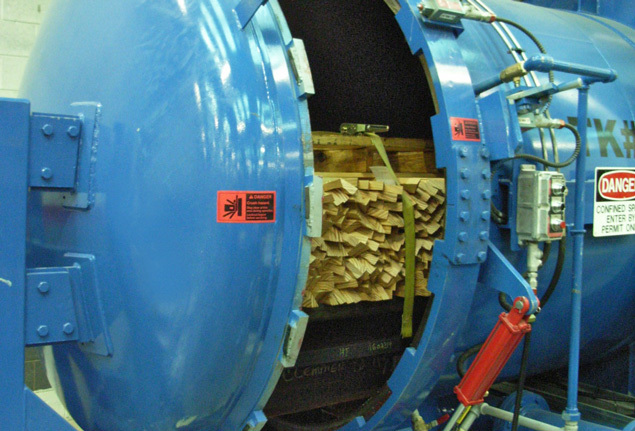 DryVac uses a double-vacuum process that protects wood from the inside out – and provides you with a level of treatment that makes dipping or spraying methods seem very crude and ineffective. A cleaner, safer process that provides you with more control and a superior final product – that’s why DryVac is better. Wooden framed windows have traditionally been integral components of low rise residential buildings in North America. The window frame industry is an important part of the Canadian economy because it is one of the few examples of a developed secondary industry that is based on a local natural resource. The industry, like any other will prosper only if it continues to meet the requirements of its consumers who are increasingly expecting improved performance and quality for an economic price. Eliminating the fear of wood rot is essential if the public is to be reassured that wood is still the premium material of construction for domestic window frames. This discussion paper reviews the status of methods for applying preservatives to wooden window frame components, and shows that the new high performance paints and cladding systems require a thorough application of preservative in order to give wood the durability needed to ensure its market position. Wooden window frames are liable to early failure unless the wood is treated with a suitable fungicide. For this reason many Canadian manufacturers apply preservative chemicals to preformed window frame components. Although the chemistry of the preservative is of prime importance its effectiveness is dependent upon the application process. Several methods for applying preservatives to finished millwork have been developed in North America and Europe. The European experience with the double vacuum process indicates that this system should be given serious consideration in this country, particularly for use with vinyl and aluminum clad, and factory painted wooden window frames. 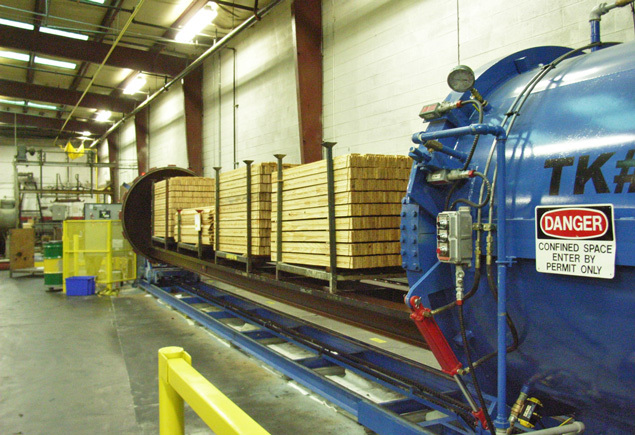 1) Spraying is performed on components passing along a conveyor (usually immediately down line from the double end tenoner); the line speed is such that the components are beneath the spray heads for 5 – 10 seconds at most, so that there is virtually no penetration of the chemical into the wood. Because spraying is carried out in an enclosed cabinet with air extraction, there is a considerable loss of fluid by removal of mist and evaporations. It is now widely accepted in the industry that a spray application has very little effect on the long term durability of the product; thus virtually no benefit is realized from the capital cost of the equipment or the operating costs in terms of materials, labour and energy. 2) Dipping involves immersing the components in a bath full of preservative for a minimum of 3 minutes. This is the procedure described in the C.S.A. A440-M84 standard for windows. Although dipped components are usually adequately protected, the process is messy. Preservative fluid drips off the wood, which must be kept in a holding area until it is dry enough to handle. The fluid evaporates into the air of the work place, and the process is rather inefficient because the tank is usually big enough for only one skid of components, so that operators spend a lot of time manhandling skids. Furthermore the liquid that drips off the treated components is not recoverable, and hence is wasted. There are other problems with dipping. The degree of penetration cannot be controlled; consequently the process cannot be adapted to different wood species. Ponderosa and white pine absorb preservative readily, but the firs absorb very little, and some species (for example, spruce) are virtually unaffected by dipping. Also, there is virtually no side grain penetration which is a serious defect in the case of windows that are designed to be used with impervious aluminum or vinyl cladding. The DV/P process was pioneered in Europe some 30 years ago and is now the standard method for applying fungicides to finished millwork in the Scandinavian countries and the U.K. It is claimed that not one window frame of the millions treated by this process has failed because of wood decay. 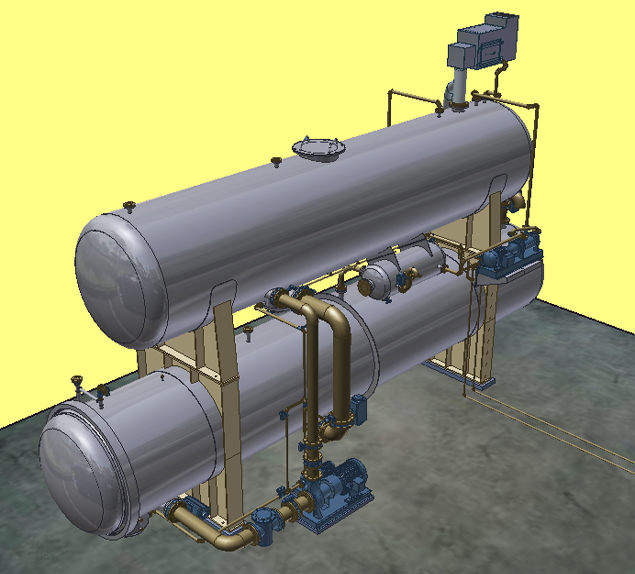 A DV/P plant consists of two tanks, a treatment vessel and a fluid holding tank. The assembly is normally located in a concrete pit, large enough to contain all the liquid in case of spillage. The treatment tank is a pressure vessel equipped with a quick opening door. The rest of the equipment consists of a vacuum system, fluid transfer and pressure pumps, valves, strainers and level and pressure sensing instruments. A cart running on rails or a conveyor system is used to load and unload the treatment vessel. Usually the system is automated, so that once the charge had been loaded and the door closed, the operator selects the operating cycle and starts the process, which takes about half an hour to complete. The operator is free during this period to undertake other tasks in the plant. Initial Vacuum: Air is removed from the wood cells in step (a) allowing the fluid to penetrate. 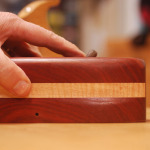 Positive Pressure: The pressure serves to force the liquid further into the wood. Final Vacuum: The excess liquid is removed from the wood and pumped back to the holding tank. The load is removed after the Final Vacuum step. The wood is almost dry at the completion of the process. Chemical losses using DV/P equipment are negligible. The fluid is enclosed inside the tanks so there is no open liquid surface as is the case with the dip and spray processes. The tanks are vented to the outside so minimal amounts of fumes are released in the plant. Fewer fumes are produced using DV/P equipment and this results in a safer and cleaner working environment. wood species and degrees of protection. The DV/P process can force preservative into hard to treat species such as spruce and Douglas fir. Although spruce is not presently used in Canada for window frame construction, it is being used for that purpose in Finland and in Holland. It is virtually impossible to treat spruce by dipping because the cells of this species tend to be fully closed. Fairly severe vacuum/pressure cycling is necessary to open the cells to accept the preservative, and this can be successfully achieved in most double vacuum process units. Traditionally, wooden windows were sold to the new construction or replacement market in an unfinished state. Painting was the responsibility of the builder or the installer. However in recent years there has been a decline in the market for unpainted and untreated wooden window frames because of decay problems, and problems in painting bare wood that has been exposed to the elements for any length of time. Consequently window frames made from vinyl and aluminum have made serious inroads into the market that was traditionally held entirely by wood. This decline is now being countered by technological changes to the wooden product, and these include factory applied coatings, and the use of aluminum or vinyl extrusions as a cladding over the exterior components of wooden window frames. Clad components require less maintenance (i.e. painting) than regular wood, but unless the wood has been effectively treated with fungicide, it is very vulnerable to decay in the event that some dampness penetrates the sheathing – which is very difficult to prevent. Thus an effective application of preservative chemical that ensures side grain as well as end grain penetration becomes an important step in the manufacturing process. breaks down, establishing conditions for decay. Fungus spores can settle in the cracks, and once it starts to grow, the fungus will accelerate the breakdown of the paint film. However, preserving the wood with a good quality moisture resistant fungicide will hold off decay indefinitely especially when accompanied by a regular maintenance painting programme. Initially, small cracks occur in the paint film as it ages, but the preservative will prevent infection by fungus spores, and the moisture resistant component will minimize the loss of active chemical that can occur by the leaching action of water, as well as stopping the wood from becoming damp. If a refresher coat of paint is applied before serious degradation of the film occurs then the cracks can be sealed up before there is any significant loss of preservative. In this way the paint and preservative act together to keep wood sound for several decades. The DV/P system is an effective and economical method for impregnating wood with preservative chemicals. It is efficient, with virtually no wastage of the fluid, and it has much less environmental impact than the other treatment methods that are currently employed in Canada. The process can be totally automated, which reduces the manpower requirement for its operation, and because each stage of the process is independently controlled, the different window components can be treated to suit the wood species used, and the type of exposure the component will be subject to in service. Wood that has been treated in a DV/P system with a good quality preservative containing moisture resisting compounds will resist decay for many decades. This treatment is particularly important for wood components that are to be finished with aluminum or vinyl cladding.